Probability is simply the likelihood of an event happening. There are 2 pens in a bag: one red and one blue. 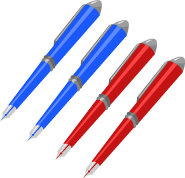 Since there is one of each, the likelihood of picking a red or a blue pen is equal, therefore the probability is equal. There are 2 balls in a bag: one purple and one blue. Since there is one of each, the likelihood of picking a purple or a blue ball is equal, therefore the probability is equal. 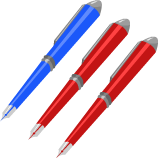 Here we have 3 pens: 2 red, 1 blue. Since we have more red pens, the probability of picking out a red is higher than (likely) that of picking out a blue. The word certain means that an event will definitely happen without a doubt. If we had a set of all blue pens, we could say that it is certain that we would pick out a blue pen from this set, since this is the only option. If we had a set of all red balls, we could say that it is certain that we would pick out a red ball from this set, since this is the only option. Impossible means that there's no way that event will happen. We can say that it is impossible that a green pen will be picked out because there are no green pens in this set. Here, we can say that it is impossible that a black ball will be picked out because there are no black balls in this set. Probability of happening an event is always between 0 and 1. Jenny rolls a six-sided die. The six sides of the die have the numbers 1 - 6 written on them. For each of the following, state if the probability is certain, probable, unlikely, or impossible. There are 6 numbers that might be rolled. 5 of them are greater than 1. Because most of the numbers are greater than 1, it is probable that Jenny will roll a number greater than 1. There are 6 numbers on the die. All 6 of them are less than 10. Because all of the numbers are less than 10, it is certain that Jenny will roll a number less than 10. There are 6 numbers on the die. None of the numbers are greater than 6. Because none of them are greater than 6, it is impossible that Jenny will roll a number greater than 6. There are 6 numbers on the die. Only 1 of those numbers is less than 2. Because most of the numbers are NOT less than 2, it is unlikely that Jenny will choose a number that is less than 2.